Our 4th Annual Auction will be be held November 1 – 10, 2019. Watch for more information!! VISIT OUR AUCTION PROMOTION PAGE for our press release, advertisements, slides, flyer etc. View donations to date and register to bid at www.32auctions.com/nhgsa2018! 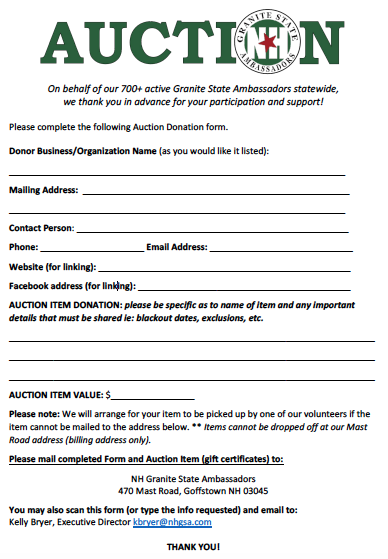 Thanks to many of you, our partners and friends, the First Annual Online Holiday Auction for New Hampshire Granite State Ambassadors was a success and raised over $4000 for our organization. Not only did the Auction help raise funds to keep our volunteers educated about NH, it helped raise awareness of our organization, and of those businesses and organizations who support and partner with us. That’s you!! Planning is now underway for our Third Annual Online Holiday Auction, and we are asking for your participation. Your support is essential for us to continue to grow as the welcoming face of New Hampshire. Funds raised with the auction will go towards enhancing our GSA volunteers experience and knowledge, and will help support front-line customer service training programs throughout the state. New Hampshire Granite State Ambassadors, Inc. (NHGSA) is a 501(c)3 NH nonprofit, which just proudly celebrated 20 amazing years of service to NH’s tourism industry. Our incredibly dedicated Granite State Ambassadors volunteer over 20,000 hours annually – hours spent warmly welcoming, and providing needed assistance and information to New Hampshire guests. The quality, long lasting impressions that our GSAs make on NH guests and residents is invaluable – at SO many levels, and their commitment and enthusiasm would be difficult to replace. Please consider donating an item to our Online Holiday Auction. It can be an actual item, an “experience”, a gift certificate for goods or services – be creative – the possibilities are endless! This is a great opportunity to showcase your business or organization! NHGSA will aggressively promote the Auction through press releases, online media, our website, and through emails. EVERY item donated will have a mention on our Facebook page, with a link to the donating business/organization. Through the online auction website, there will be a listing of your item, along with a photograph, donor information and link to your website. The Auction will run online from October 26 – Novmeber 5, 2018. 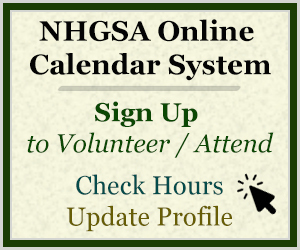 Remember – your donation will not only benefit NHGSA, it is a marketing tool for your business or organization. Our GSAs, industry partners, and their family and friends are our top bidders – meaning this is “front-line, word-of-mouth marketing” for your business/organization! The auction is taking place just as the holiday shopping season is getting started. It is our hope that our publicity may prompt those bidders who did not win to seek out your items/services directly! Please note: We will arrange for your item to be picked up by one of our volunteers if the item cannot be mailed. Items cannot be dropped off at our Mast Road address.